3 lenses per box @ $29.76 per box. Minimum order 2 boxes (three months' supply). 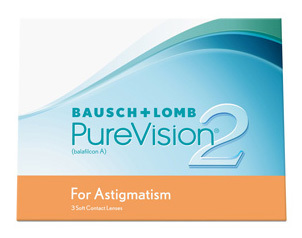 Designed to be worn for up to 30 days continuously, the Purevision 2 HD for Astigmatism uses Bausch & Lomb's Lo-Torque design and next-generation spherical aberration correction to give exceptional stability and vision, plus its silicone hydrogel material allows natural levels of oxygen to reach the eye and gives a consistently smooth, wettable and clean lens surface for extra comfort.